Update: This story was originally published on July 19. Pesky blemishes have a tendency to appear out of nowhere and often at the worst time (i.e., before a first date, day of an important meeting). My clients often say that dealing with breakouts is one of their absolute top concerns. 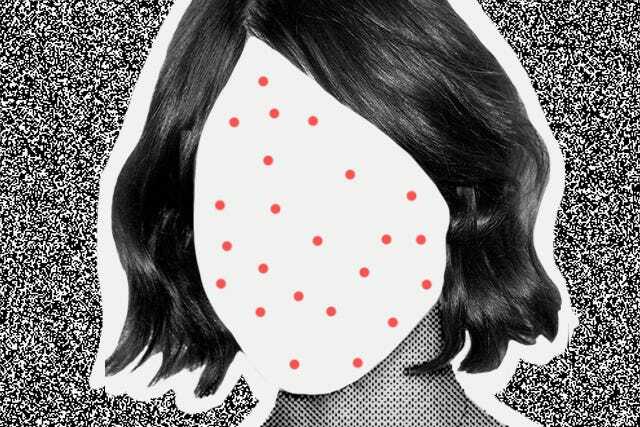 But, before you take matters into your own hands by applying spot treatment or trying to pop it, you first need to understand the type of blemish you have. A breakout can lead to scarring and discoloration if not handled correctly. When a blemish appears, you have to know that your body's healing mechanisms will automatically begin doing everything to quickly fight the infection, even before you’ve applied any topical acne treatment. A pustule is a type of blemish where the infection works its way up to the surface of the skin resulting in a visible whitehead. (Usually, this entire process — from early infection to visible blemish— can take a few days.) The blemish's coming-to-the-surface is your body’s way of excreting the infection. While it can be tempting to want to eradicate the first signs of a whitehead, it's better to wait for the infection to fully appear before applying any sort of drying spot treatment. There's a good reason to wait: If you start drying it out immediately, dry cells and flakiness will appear, and these in turn will prevent the whitehead from being able to emerge like it wants to. Drying out the skin in this manner only keeps that infection trapped underneath the pore. So, just be patient, wait a few days, and once that whitehead is completely visible on the skin's surface, gently squeeze out the infection with a fingertip wrapped in tissue or with two cotton swabs. If you wait until it is ripe, as I like to say, it should pop out with little resistance. Now is when you want to apply a spot-drying treatment, which will work its way into the pore and eradicate any residual infection once it has been manually removed. Look for a spot-drying product containing camphor, sulfur, or zinc oxide. A cyst is a type of blemish where the infection will NOT come up to the surface but instead will stay embedded within the skin — sometimes up to three weeks. Eventually, the body will reabsorb the infection, allowing it to dissipate. Although you're likely to feel something painful beneath the skin's surface, cysts should never be picked. You can, however, apply ice for ten minutes and repeat every few hours; this will help reduce inflammation and diminish redness and swelling. You can also treat it with a topical cyst treatment, which helps dissolve the infection while also preventing future ones. I should note that cysts can be sometimes exacerbated by dairy consumption, especially when they occur on the chin and jaw areas, so consider cutting them out entirely, or just temporarily, if you're noticing extreme flare-ups in these areas. Once the blemish has healed, you'll want to minimize any trace of the breakout. Gentle exfoliation will help the leftover scar fade, while a skin lightening, exfoliating, and anti-inflammatory product will help the post-breakout discoloration. For speedy fading, try using a post-breakout fading gel. And you should always use sunscreen on a daily basis; this will help speed up the fading process as UV rays from the sun can cause the scar to darken or redden. Sadly few of us are exempt from experiencing the occasional blemish, but maintaining a consistent regimen, along with practicing some patience, will allow for a proper healing process. And, remember: don't pick it before it's ripe!